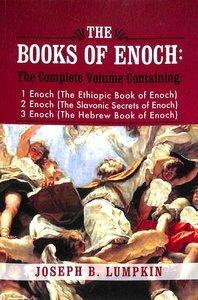 The Books of Enoch: A Complete Volume Containing - 1 Enoch (The Ethiopic Book of Enoch), 2 Enoch (The Slavonic Secrets of Enoch), 3 Enoch (The Hebrew Book of Enoch). For the first time, the major books making up the body of Enochian literature are presented to the public in a single volume. Joseph Lumpkin is the author of the best-selling work, "The Lost Book of Enoch." His work on both 1 Enoch and 2 Enoch have met with wide acceptance and plaudits. Now Lumpkin has completed his work on The Third Book of Enoch. 3 Enoch has not been available to the general public for over eighty years, until now. His previous releases of 1 Enoch and 2 Enoch are placed along side The Hebrew Book of Enoch (3 Enoch,) which has been translated using Hebrew source materials and contains "in-text" commentary. This volume contains copious notes and commentaries in all three books, designed to guide the reader through the difficulties of language, theology, and mystical references. It is a necessary resource for those engaged in the study of religion, religious history, or mysticism. About "The Books of Enoch (3-in-1)"